Getting out to experience all the great things the Vail Valley has to offer during the winter can take a bit of time to plan out. Just because you’re on vacation, doesn’t mean you can’t (or shouldn’t) get an early start to your day. Most areas and activities tend to get busier as the day goes on, and nothing beats the feel of the fresh mountain air crisp in your lungs when you head out for “first tracks”. 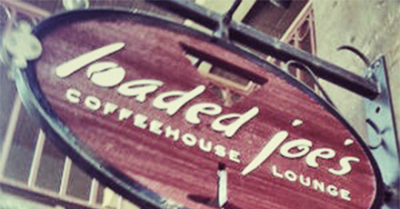 Reward yourself for resisting the snooze button by heading into the Vail Village and grabbing a freshly brewed cuppa joe from Loaded Joe’s. They have locations in the Vail Village and Avon so whatever resort you decide to hit up for the day there’s no reason to forego your daily pick-me-up. This fun little shop serves gourmet espresso by Rococo Coffee Roasting alongside delicious breakfast sandwiches and fruity smoothies to get your day off to a great start! Now that your belly is full and your eyes are wide-open, time to hop on the lift and earn your turns! If you aren’t sure of the best runs to take, we’ve got you covered. Vail has a great array of terrain for skiers and riders of all abilities, and the Back Bowls can’t be beat. To get your ski legs primed up, consider taking a quick jaunt down Born Free. This is a long, green-to-blue lap that starts at Eagle’s Nest and brings you right back down to the Eagle Bahn Gondola. Looking to head out to the fields? Poppyfields is an excellent choice as it is the only groomed run out back. When you’ve completed the descent, catwalk over to the one-and-only Blue Sky Basin famous for its impeccable views. If you happen to be a bit more daring, Riva Ridge is one of Vail’s original trails and clocks in at 4 miles long. This steep lap alternates between blue and black pitches, but watch out for the “Tourist Trap” as this is the run’s steepest section! Be sure to beat the 3PM après crowd, and hit up Wyld in Beaver Creek for a delicious bite and winter warm-up cocktail. Or stop for après at Blue Moose Pizza, Dusty Boot (Beaver Creek), Vendetta’s (Vail) or Vail & Beaver Creek Chophouse. Whether you want a slice of heaven, filling yet scrumptious burger or a hot toddy to warm you up, the delicious array to satisfy your hunger needs are just steps away from the ski mountains in both Beaver Creek and Vail. After you rest and refuel at Wyld, rent a pair of skates and show off your ice skating moves in the heart of Beaver Creek. Surrounding the rink are fire pits and plush couches where you can watch the little ones speed around while you warm up. It’s not too late to get your annual Christmas photo; the Beaver Creek Ice Rink offers a picturesque backdrop for a one-of-a-kind photo op! The ice rink is open daily from 12PM to 9PM and admission with rental skates is $15 for skaters 13 years and older. 3:00PM: Every year, Beaver Creek celebrates opening day with their Annual Beaver Creek Chocolate Chip Cookie Competition, where the winning recipe can be tasted every day at 3PM. 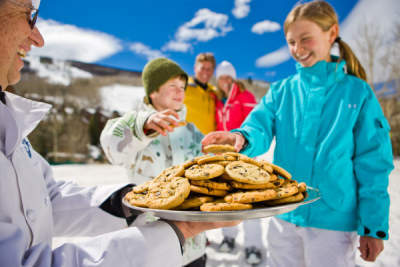 Cookie Time happens daily and allows you to enjoy fresh-baked cookies at the base of the Centennial Express Chairlift, and the second level of the plaza escalators. Make sure you’re on time as the cookies run out fast! Take a night off and let others do the meal prep and cooking for you. 4 Eagle Ranch is one of those unforgettable experiences that your family will be talking about for years to come. 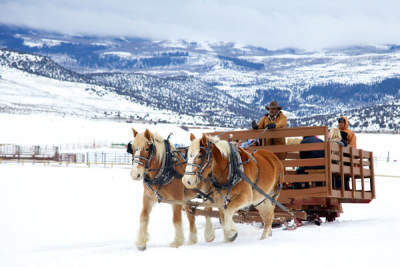 Tour the 4 Eagle Ranch grounds in a horse-drawn sleigh while sipping hot chocolate. After your ride, step into a piece of history and country cuisine. You did it! Time to relax and reflect on an amazing day packed with physical activity, delicious food, and apre cocktails. Warm up from the cold Colorado night at your Vail on Sale lodge in the hot tub, near a fire, or with a hot and warming beverage.